The Truth about Swim Readiness and The Most Important Facts to know about your child and their abilities. Home Press The Truth about Swim Readiness and The Most Important Facts to know about your child and their abilities. For many years, the American Pediatrics Association and American Red Cross determined that the best age to begin swim lessons was 4. 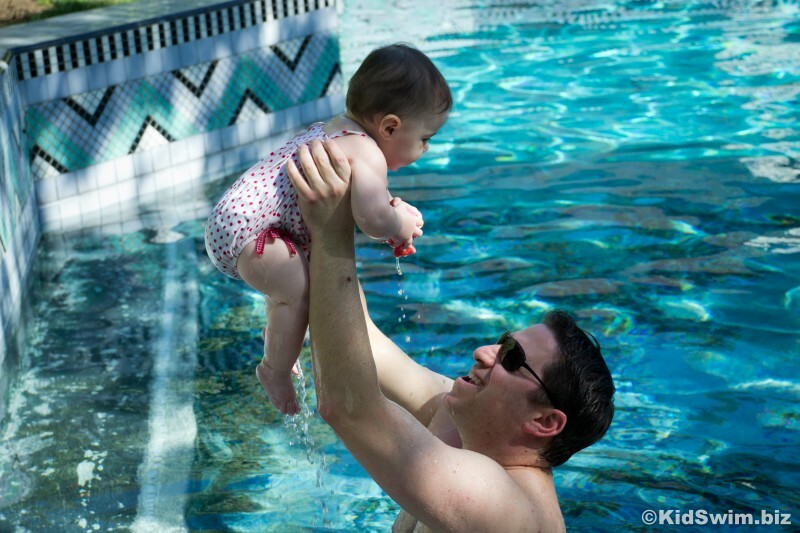 These days, they, along with most other organizations, have revised their statement saying that it is almost never too early to begin swim lessons and learn to swim. The reason why age 4 is ideal (and frankly it is ideal) to begin lessons is because cognitively, physically and emotionally, your children have solidly moved out of the toddler stage and are firmly entrenched in the preschool stage. Physically, their core development is at its strongest since birth, their coordination is more sophisticated, they are able to grasp and process a multitude of complicated instructions and their endurance level is much higher than in previous stages. Additionally, they are more rational characters, less prone to tantrums, succumbing to hunger and exhaustion, and their fears are often tempered. I have found that when starting lessons with a four year old child – who up until that point, may never have had lessons at all previously – they learn extremely quickly and move through the stages at an accelerated rate. In terms of beginning lessons earlier than age 4, I do highly recommend it, even as young as 6 months of age – however – and this is a very big stipulation – it is unreasonable to embark on the experience with any expectations about what your child should be doing. Prior to age 4, your child may or may not swim. One is not better than the other. Trust me on this. I have seen children forced to learn the physicality of swimming at age 2, but they did not learn inherently on their own and so they are often confused, puzzled, awkward and unsure. They, in a sense, learned before they were ready to learn. I have also seen children as young as 18 months or 2 years take to the water as if they were born into it and learn to swim so happily and fearlessly that I, as the fortunate instructor, almost cannot take any of the credit. It is obvious that many children instinctively relax in new situations and embrace the experience of being in water without hesitation. We obviously want to take advantage of that and continue to keep them swimming so they don’t forget what they learn from season to season. Here’s the dirty little secret:very young children do forget any new skills learned if there is a gap of several months between practicing skills. It is all well and good to take an 18 month old and ‘teach them to swim’ but if they are not around pools and water for six months, I can guarantee that they will need to be reintroduced to it as though they had never had lessons before. I firmly believe that the developmental approach works because it gives each child the time to explore the environment peacefully and respectfully, without forcing the child to comply with a generic checklist of what he/she should be doing. It takes into account each child’s character, temperament, age, stage, emotional and physical maturity. Another thing to know – and this is perhaps the single most important part of learning to swim is that your child will NOT be water safe, no matter how well they learn to swim, by age 3,4,5 or in most cases even 6. Water safety is a multi-layered and complex state of being. A child’s level of swim readiness depends upon both experience and maturity. A lot of children can be called water savvy and can appear highly skilled in very controlled situations (being the only child in the pool at their own house, a pool they are very familiar with, parent sitting right on the side of the pool watching closely, etc..). They can look like they are water safe. 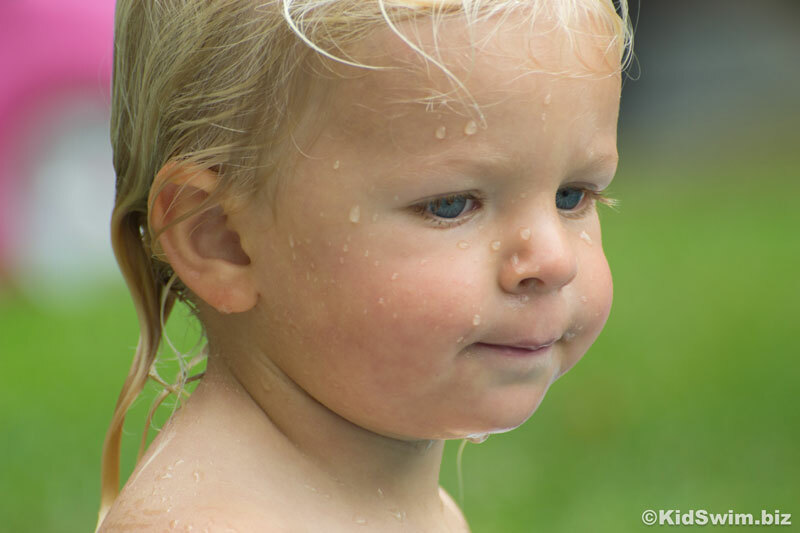 But if you add in any new variables or change the location, you cannot guarantee that your child will know how to react and will be able to anticipate potential problems – this is why claiming a very young child is ‘water safe’ is so dangerous. We as parents need to be as vigilant as possible around our children when they are around the water. Any indication that our children are ‘safe’ means instinctively we can relax and quite frankly, that is the most dangerous component of all. Prior to age 4, children should be exposed to water as early as is comfortable and accessible to families. Even a parent/child class is wonderful and beneficial in forming a benevolent association to aquatic experiences. Children should begin real instructional swim lessons at approximately 2.5 years of age (this is a general rule obviously) and ideally private lessons at this stage are the best bet for a calm, focused, safe and controlled environment. It is best not to force children to swim EVER and especially not at ages younger than 4 years. Children have their own mechanisms for protecting themselves in new and unfamiliar situations. Overriding this by force (even gentle coercion to comply is still force) is extremely disrespectful and sends a message to your child that their instincts are not to be trusted. By age 4 most children who’ve had benevolent experiences around water or little experience, WILL learn to swim easily, unless there are underlying issues not identified. 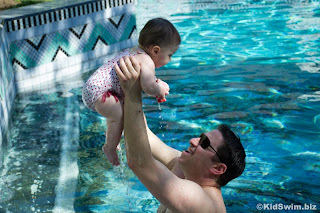 A very young child (18 months – 2 years) who obviously seems comfortable and natural in the water should be encouraged to swim and in the best case scenario, to limit regression, keep them exposed to and swimming year round. A child who was swimming at a very young age and seems to have forgotten everything, will quickly re-adapt and surpass their previous season’s skill levels, so do not worry if it looks like they have slid back into becoming a non-swimmer. It is only temporary. and lastly and most importantly – never ever classify a child under the age of 7 as water safe, no matter how well they swim. The kidSwim team has been hand-picked by founder Lisa Cook. Many of our administrative staff and instructors have been with the company for upwards of five to seven years now and all of kidSwim’s instructors are certified and bonded and trained in kidSwim’s development method.